“Make us yer first and second officers, Capt'n," they said. “Ye'll not regret it. "“Oh," said Jesus, “won't I? Tell me lads. Can ye follow me when I sinks down to the ocean bed and take me place among the bones of dead men? Can ye join me when I drinks the bitter rum of the Almighty's wrath and drains it to its dregs?" “Aye, Capt'n!" said they, comin' on all wind and spume, “Aye, aye, we be the men for that. "Well, well" said Jesus. “Indeed ye shall be sharin' in me trials, mateys. But I'll not be handin' out firsts and seconds this day." Now when the other crewmen heard about this they took on mighty surly. But Jesus called 'em to assembly midships. “What a brace o' laggards, ye are," he said. “D'ye think this be the House o' Lords? Are ye lookin' for airs and graces and fancy duds? “On this ship ye rise up by goin' down. Ye want to be high and mighty? Then get to the galley and bilge. Start servin' yer shipmates. “Take yer bearin' from your Capt'n, lads. Does he make ye wait on 'im? Does he take on like one o' the Admiralty? Nay, he'll be spillin' 'is blood for all yer sakes, afore this cruise be through." 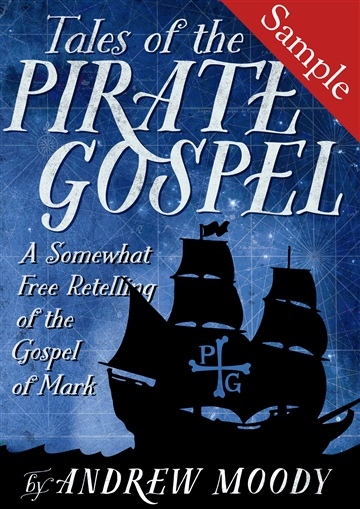 Tales of the Pirate Gospel is a free retelling of Mark's Gospel in the golden age of piracy. The theology is the same, but the language, setting, geography and parables have been changed. It's not the Bible, but it's good fun, and might help you to see things that you hadn't noticed in the Bible before.